In one tray, glistening patties of tofu lay in neat rows. Another tray contained a salad with cooked greens, wood ear fungus, and roasted tofu. The row of trays contained other treats: pickled bamboo, spicy noodles, figs, and cookies. And, of course, a pot of rice sat at the end of the table. This is the kind of vegetarian fare that has drawn people to Buddhist temples in China for centuries. Standing over this display of foods, one can understand why the kitchens at these temples are often called Fragrant Vegetarian Kitchens. But this was not China. 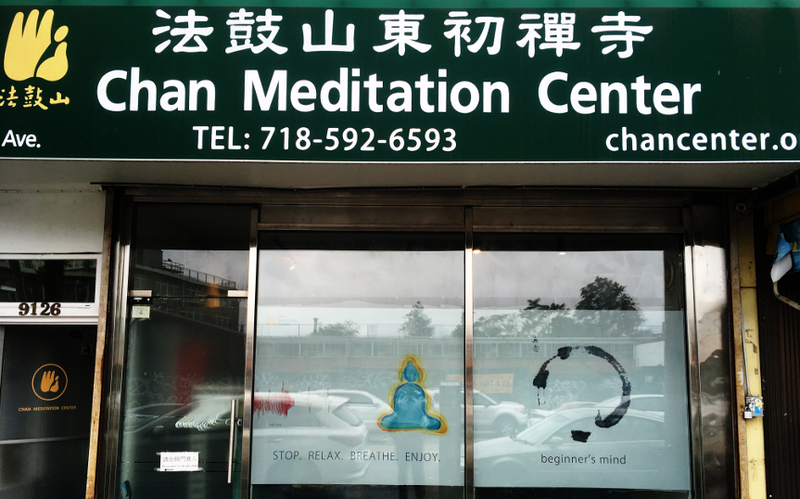 I was at the Chan Meditation Center in Queens. The nuns at the Chan Meditation Center refer to it as a temple, and indeed it performs all the functions of a temple, but its appearance might surprise people used to the most spectacular Buddhist temples of China, with their imposing architecture and statues. Within the Chan Meditation Center is a long room that feels a little like a lecture hall, with folding chairs facing a table at the far end. Behind the table is a modest shrine made of unpainted wood, on which rests a Buddha, flanked by a bronze bowl-shaped gong and a large gourd. Behind the Buddha is a line painting of Guan yin and two pieces of Chinese calligraphy. This Sunday, open house at the Chan Meditation Center began with a discussion by the Venerable Chang Zhai on the essentials of Chan practice. In particular, her discussion focused on stopping wandering thoughts. This proposal requires some soul-searching for me, since I more or less make a lifestyle of wandering thoughts. It is comforting, however, that one of the methods she described uses rather than rejects words. She spoke of huatou (话头), which can be translated as “origin words” (literally, “head words”). These are questions that cannot rationally be answered. She gave three examples: “Who drags this corpse around?”, “Who is reciting the Buddha’s name?”, and “What was my face before I was born?” These are all what she called sihuatou, or dead huatou, since they have come down to us from antiquity—but we can make up our own. When the discussion was over, someone clapped with wood blocks, the Venerable Chang Zhai retreated to another room, microphones and cameras were rapidly removed, and the trays of food were brought out. A nun came to the table and helped herself to a modest portion of food, and then turned to me and invited me to follow. I tried a little of everything. All of the dishes had been prepared with a similar vision: they all highlighted the natural flavors of their ingredients, mild with a cleansing freshness. The tofu was savory but light and the salad was rich with different flavors, but left the palate clean. This was an excellent meal. “Have you ever been to any Buddhist events before?” a fellow sitting next to me asked. I told him I had some exposure to Tibetan Buddhism. “Same thing, different flavor,” he responded. 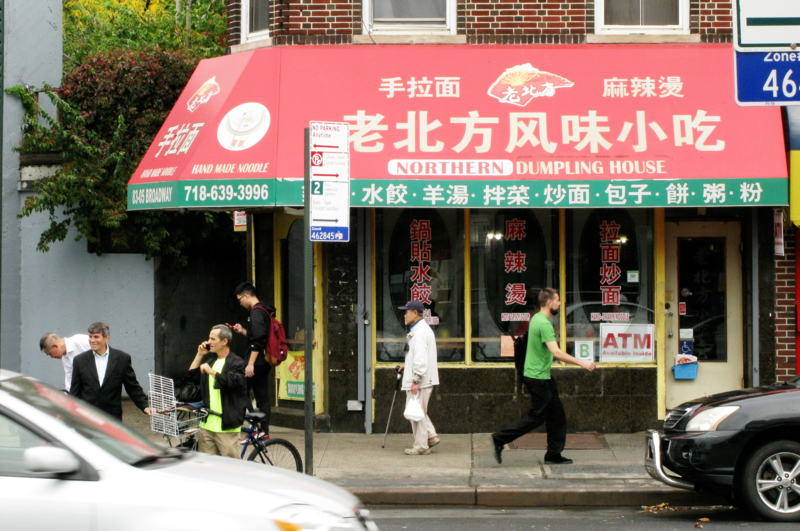 Where the Port Washington-bound LIRR crosses Broadway, a bright red awning advertises hand-pulled noodles and northern dumplings. Under this awning is one of the homiest restaurants in Elmhurst. Tall windows and glass doors wrap around the front of the building, admitting plenty of light to the dining area. The dining area is roomy (if crowded) with a high ceiling. A large bronze relief sculpture depicting river boats hangs on one wall. There is no table service; after ordering at a counter, you sit where you please. 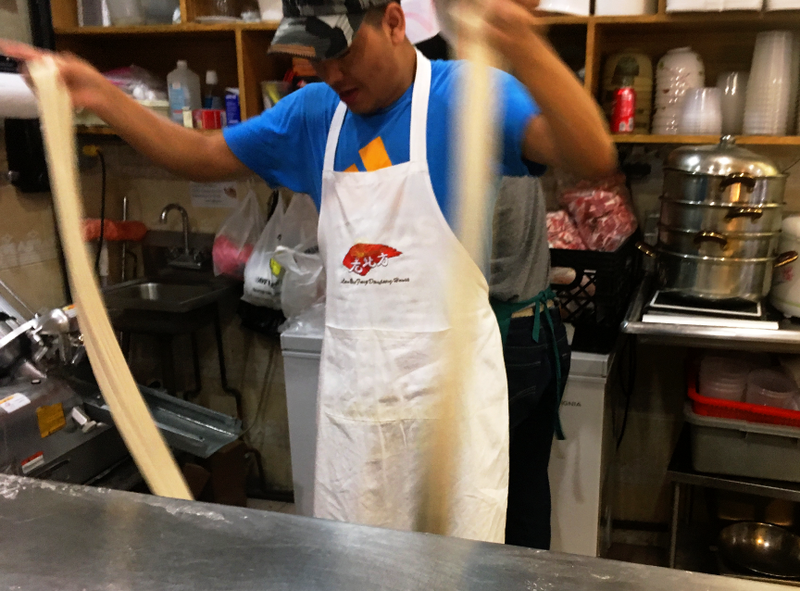 I ordered lamb and hand-pulled noodles, and then went to watch my noodles being made. There were a couple of stools in front of the noodle-making station, apparently especially for people to watch. The noodle-maker was happy to have an audience. He was remarkably fast. 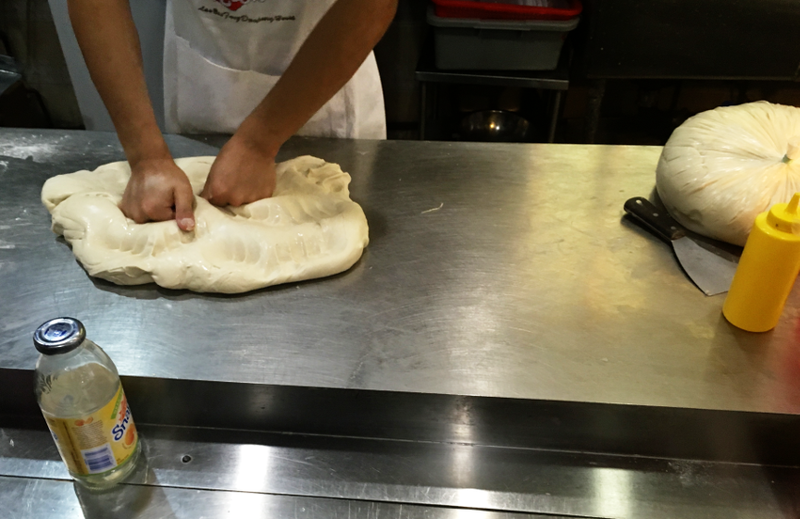 A lump of dough became handfuls of noodles in a few minutes. (“About a year,” he said, when I asked how long he’d been doing this.) 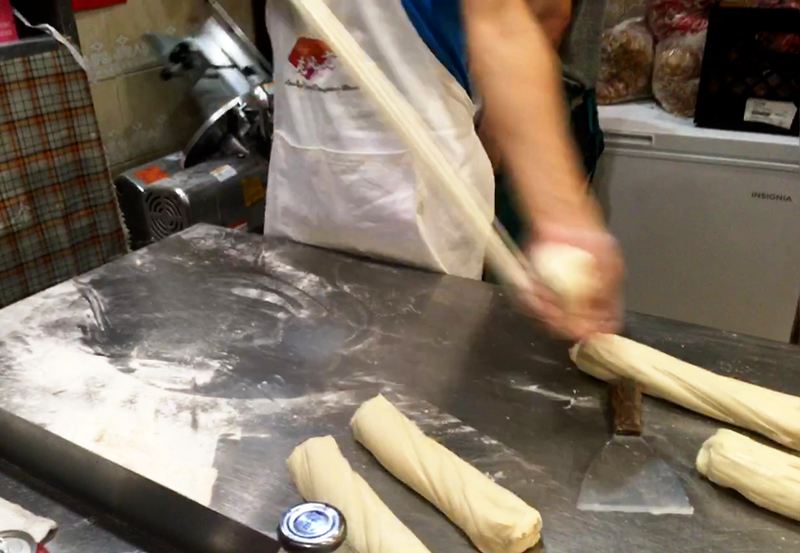 I believe this was the Lanzhou method of pulling noodles. 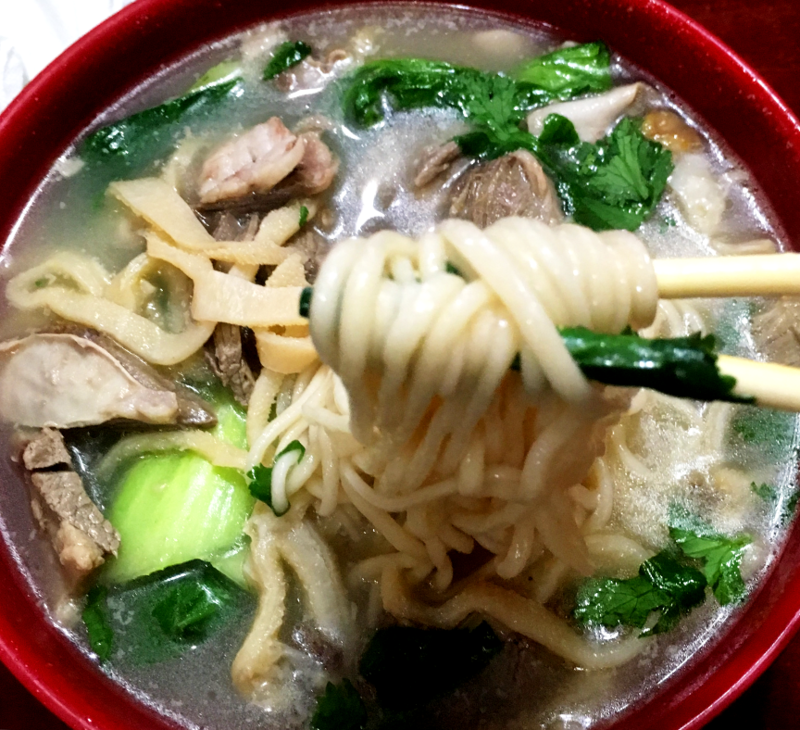 The noodles came mixed with slices of lamb and cubes of liver, as well as stalks of bok choy. The soup was lightly seasoned. Much of the flavor came from the stewed lamb—but ginger and garlic rounded out the flavor to make a tasty broth. The noodles had a remarkable mouth feel. They were chewy, but also slightly wiry, like very thick ramen noodles. Excellent. October 5th: The moon is full tonight. Some people may know this full moon as the Harvest Moon. Many people will not think of it at all. 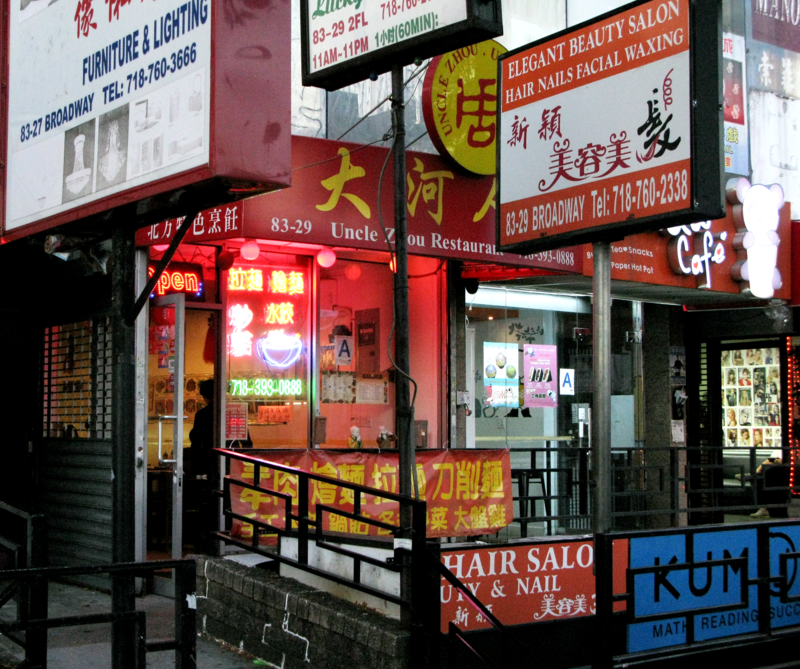 But in Flushing’s Chinatown, this full moon is the occasion for eating mooncakes. Mooncakes are small, round cakes with a filling, often red bean paste or lotus-seed paste. 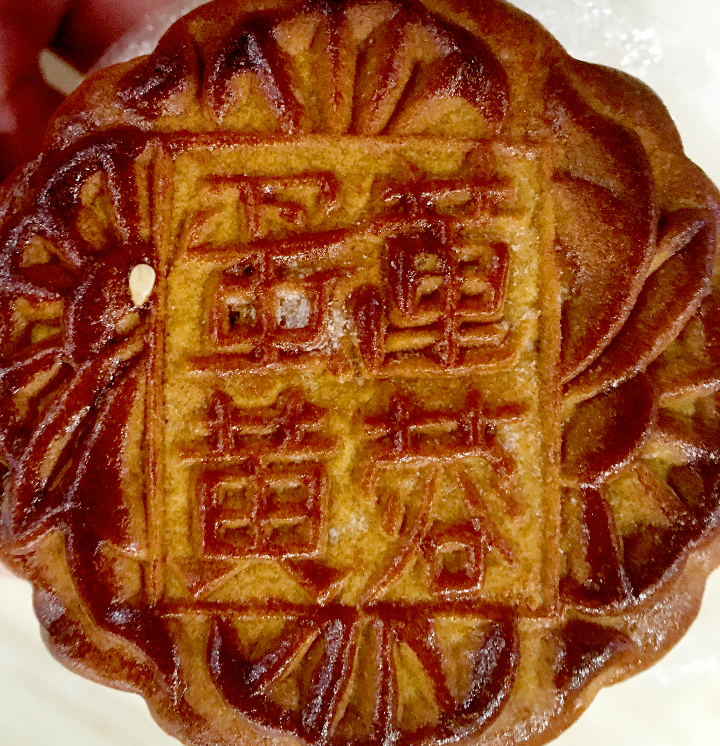 Larger mooncakes (the size of the palm of a hand) usually have a salted egg yolk in the center. 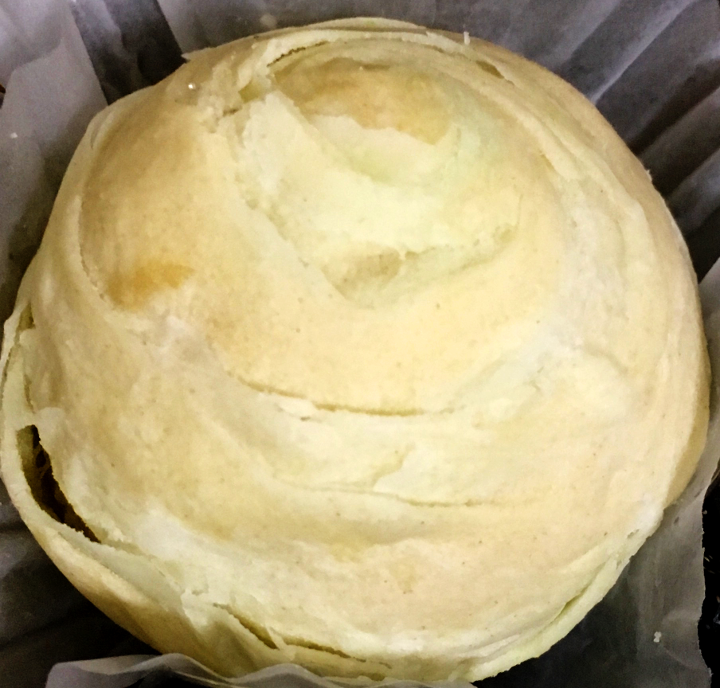 The origin of mooncakes is not very clear, but they may date back to the Song dynasty (tenth century). This year the festival started on the 15th day of the month on the lunar calendar, or yesterday—so I went with a friend to Flushing to eat mooncakes. The almost-full moon was dazzling, but life on Main and Roosevelt Streets showed few signs of change. As usual, fruit-sellers stood behind boxes of fruit, yelling their prices, and pigs’ feet and roast ducks were on display in shop windows and on tables in front of shops. Pirated DVDs were also on sale, and between a massage parlor and an herbal shop, a sign directed visitors to an “adult entertainment” shop up a flight of stairs. But, as ever, the main attraction was food. 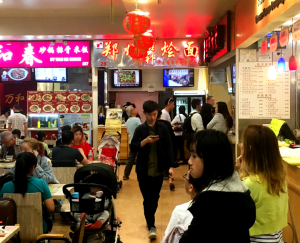 In unnamed malls—corridors lined with tiny shops leading from the street to the back of the building—families sat in tiny, fluorescent-lit noodle shops having dinner out. The menus at these restaurants were remarkably long for such small establishments, featuring noodles with pork and vegetables, but also with every imaginable kind of offal, duck blood, pigs’ ears, and so on. And all along Main Street and its tributaries people stopped at bakeries, dumpling shops, and restaurants for food. No corner in this neighborhood is too small for something interesting to develop. 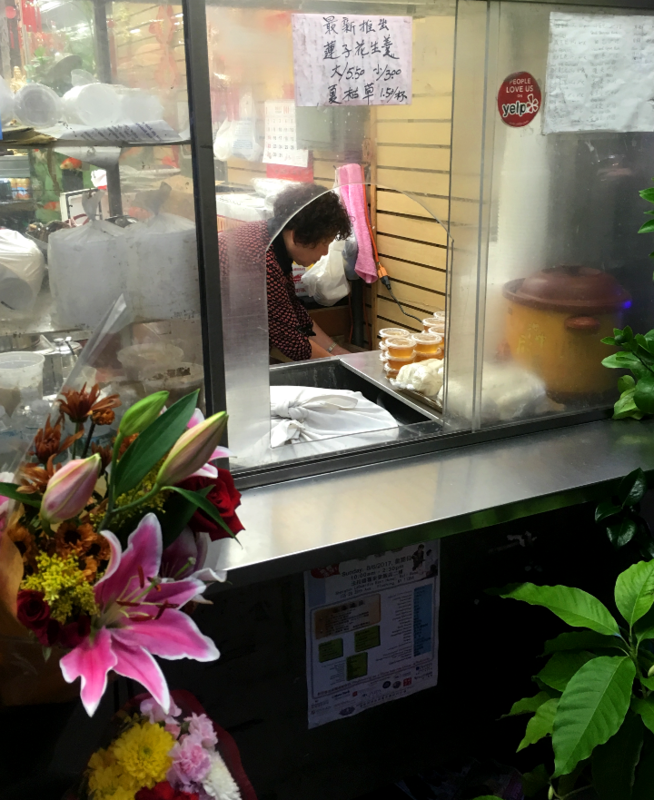 My friend stopped at a florist on Roosevelt Avenue and pointed out a tiny stall selling a variety of treats—but mainly douhua, or creamy tofu. Behind the window, a woman tended a vat of soy milk and a cooker full of hot tofu; cups of sweet ginger syrup sat in stacks to her side. I took a sample of this home. Mixing the sweet ginger syrup with the douhua makes an excellent treat—simple, mildly sweet, and very tasty. The menu offered mostly dishes from Hunan and Sichuan, as well as some intriguing dishes of unknown provenance, such as leaping fish (which I had not the heart to order) and frog casserole. 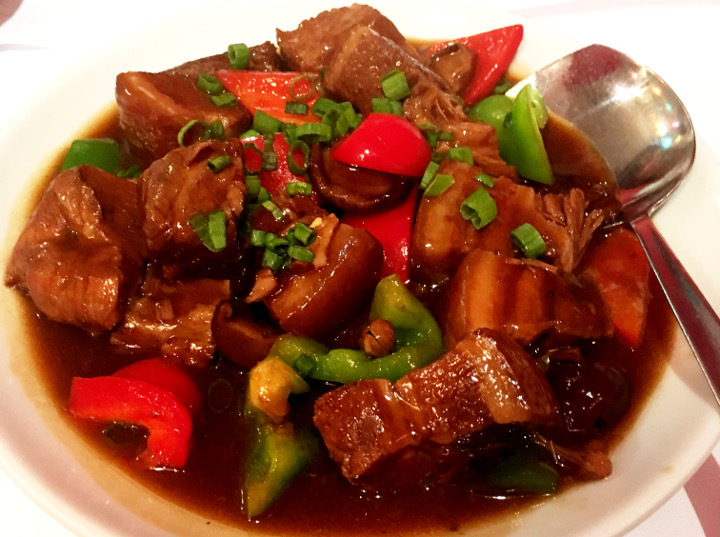 We ordered Mao’s Braised Pork, a classic dish of Hunan, and spicy Sichuanese fish. The spicy fish came first, in a great bowl of soup filled with peppers, noodles, cabbage, and fish. It was hot, with a strong chili flavor, and a little sour. It was very good (although, alas, it did not have the distinctive peppercorn flavor that I hope for in Sichuanese food). The braised pork came mixed with roasted peppers and covered in sauce. The first bite is surprising: a candied flavor, like honey-covered walnuts, fills your mouth. This is a captivating dish. It is no wonder Chairman Mao (a native of Hunan) liked it so much. 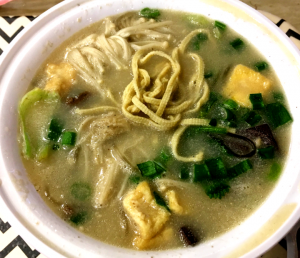 The menu at Uncle Zhou’s in Elmhurst is divided by noodle type: hui mian, la mian, and dao xiao mian. Hui mian, the wide, braised noodles of Henan, top the list. This is natural. 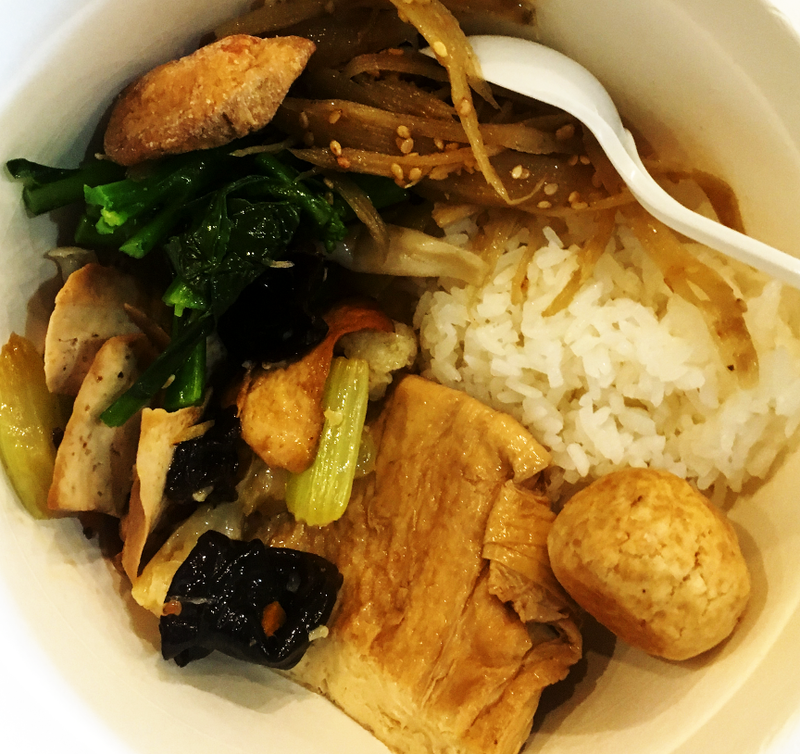 Uncle Zhou is from Henan, and his restaurant proudly specializes in its cuisine. 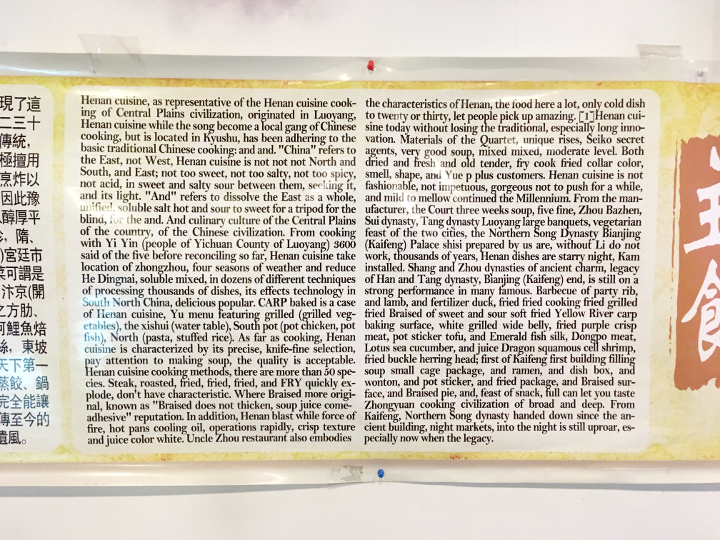 “Henan cuisine, as representative of the Henan cuisine cooking of Central Plains civilization, originated in Luoyang,” begins a text on the wall. In a dizzying discourse full of mysterious associations and grammatical innovations, the text goes on to mention Kaifeng, another great ancient city in Henan, and several dynasties from the Shang to the Northern Song. It is impossible to understand most of this text (to select an early instance of its difficulties: “’And’ refers to dissolve the East as a whole, unified, soluble salt hot and sour to sweet for a tripod for the blind, for the and.”). But the details don’t matter. The point is that Henan bears the imprints of countless generations—the Buddhas carved in Henan’s caves and the stories of “devil’s markets” of Kaifeng that opened at midnight and closed at dawn—and the cooking of Henan has a similarly rich background. Naturally, I had to try Uncle Zhou’s hui mian. I ordered what the English portion of the menu describes as “Dial Oil Hand-drawn wide noodles”. I believe the Chinese name, 油泼烩面, is better translated “Hand-drawn wide noodles sprinkled with oil” (I am guessing the oil is just peanut oil). The dish brought to me was a bowl full of folded, strap-like noodles with bok choy, smelling like peanuts. I immediately bit into the noodles, but the waitress came to my table and corrected me. 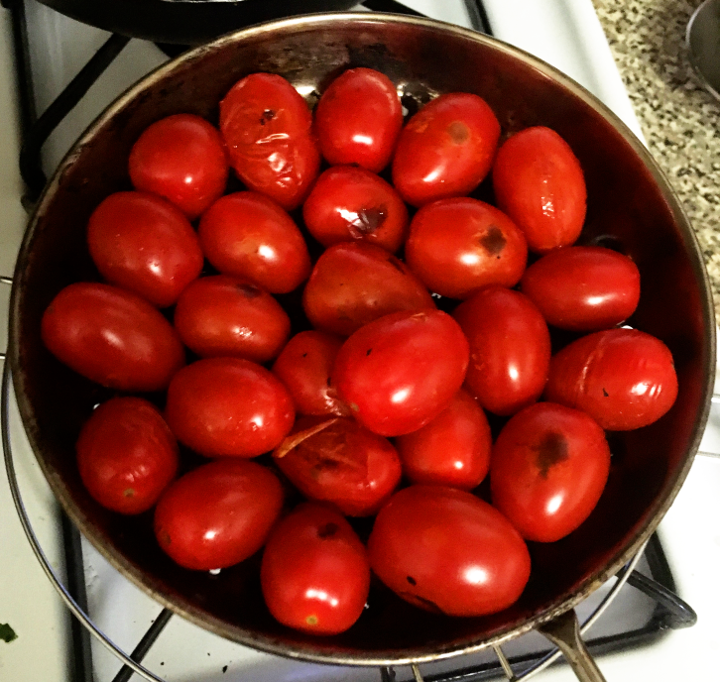 “You have to stir to get oil.” So I stirred the noodles, and they became coated with reddish oil. The menu marks this dish as hot, but it is a pungent heat, like that of horse radish, and on the mild side. It is accompanied by sourness and a little bitterness. The noodles are chewy and satisfying. These noodles sprinkled with spicy oil are a little like a pasta salad. I came another time to try Uncle Zhou’s dao xiao mian. Dao xiao mian (often translated in English as knife-scraped noodles) do not originate in Henan, but in the more easterly Shanxi Province. I do not know the subtleties of the preparation of all the different kinds of noodles, but it is said to take someone who already knows how to prepare la mian several months to learn to prepare dao xioa mian, so I think there are differences in the way the dough is kneaded for the different kinds of noodle. 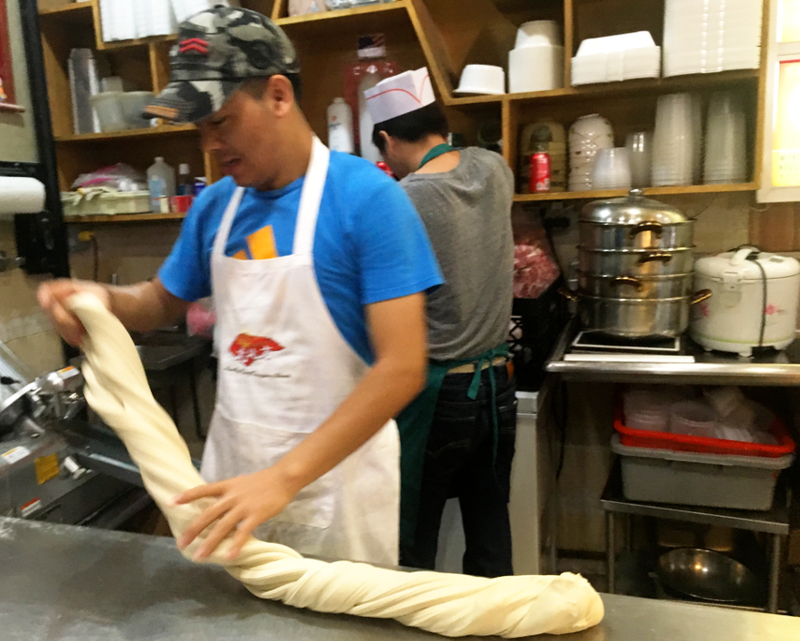 The definitive step seems simple enough: to make dao xiao mian the noodle maker takes a loaf of kneaded dough and shaves noodles off the loaf into boiling water with a knife (in contrast to pulled noodles, which he stretches, and twists, and stretches, and twists repeatedly). I ordered spicy beef knife-shaved noodles. They arrived in a soup spotted with chili oil, mixed with slices of tender beef. 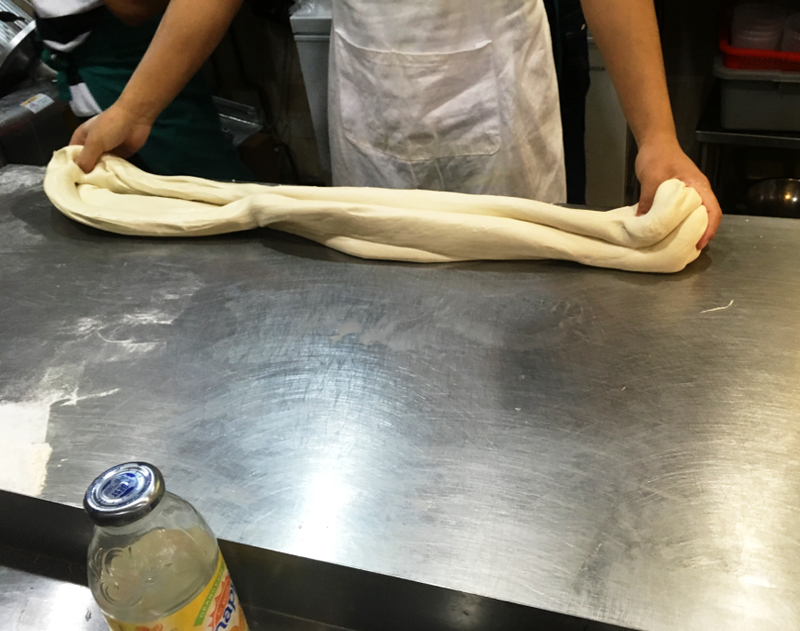 The noodles were about an inch wide, thick, with a spine running down the middle, and dense. They could almost stand on end. The soup was spicy—hot enough to make me sniffle. This was an immensely satisfying dish. The décor at Uncle Zhou’s is traditional, and not very imaginative. Red paper lanterns hang in a row from the ceiling; Peking Opera masks frown across the room from one wall, and a statue of Guan Yu frowns back from a shrine on the opposite wall. Nevertheless, on a weekday evening, you may find many young people eating here. It is a nice place to share noodles with a date or a friend. The legacy is worth trying, uproar or no. “Add a little kheema,” the bartender at Himalayan Yak told me, when I described the ingredients I was planning to use for chicken momos. Ready to break another blender? 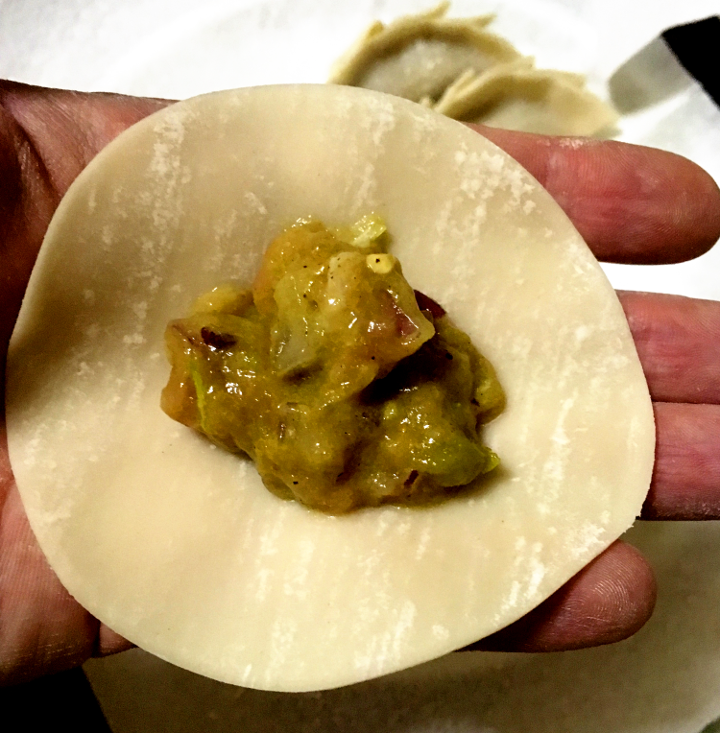 This was the first of a few inquiries (followed by experiments) in my efforts to create Newar-style—or at least Nepali-style—chicken momos. 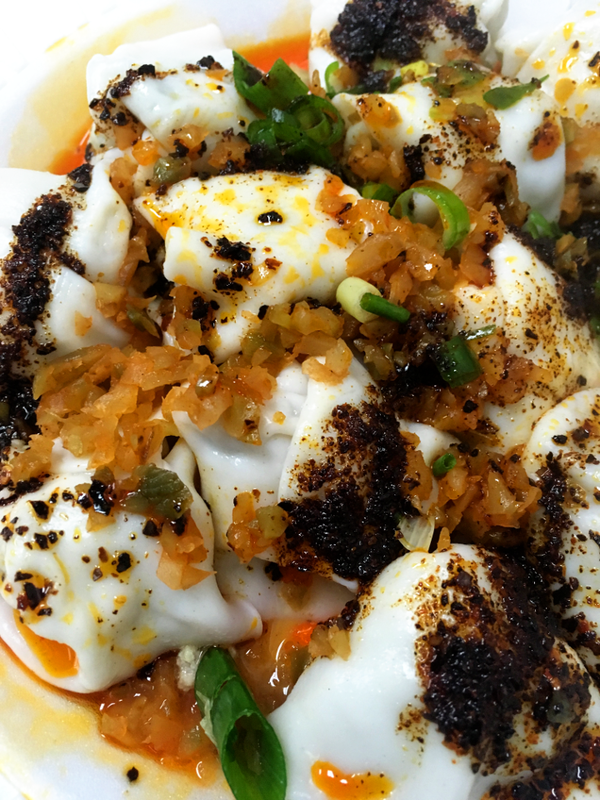 I broke two blenders in the course of these experiments, overate on as many occasions, and found myself studying momos at the restaurants in Jackson Heights with a more careful palate. In the end, experimentation was not enough. “They are not juicy enough,” I told the bartender a few weeks later. This led to a consultation in Nepali with several people sitting at the bar. I could not understand a word of it, but eventually a youngish man, described by the bartender as a master of momos, turned to me. The momos in my next batch were juicy, with a bright and clean spice profile typical of Nepali cooking. I overate again. 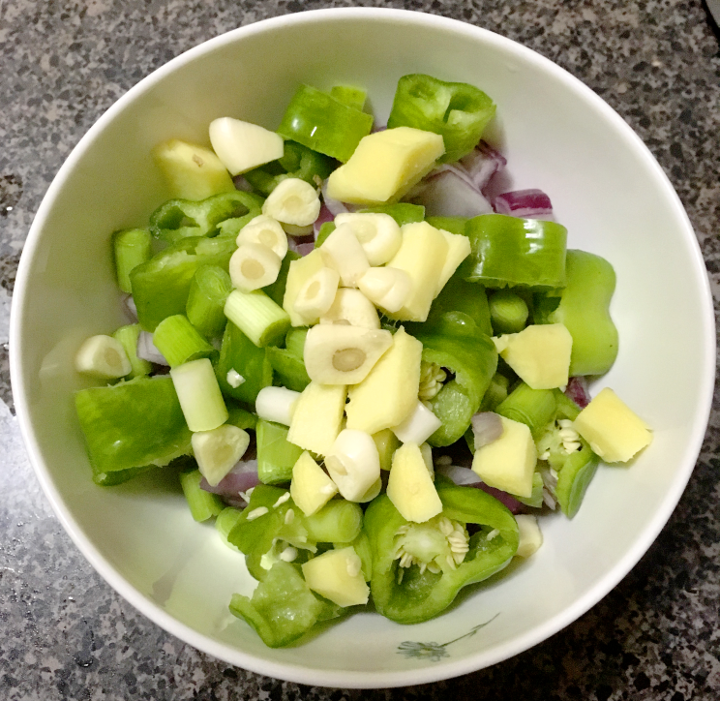 The ingredients can be combined in a food processor. The result should be no thicker than a smoothie. 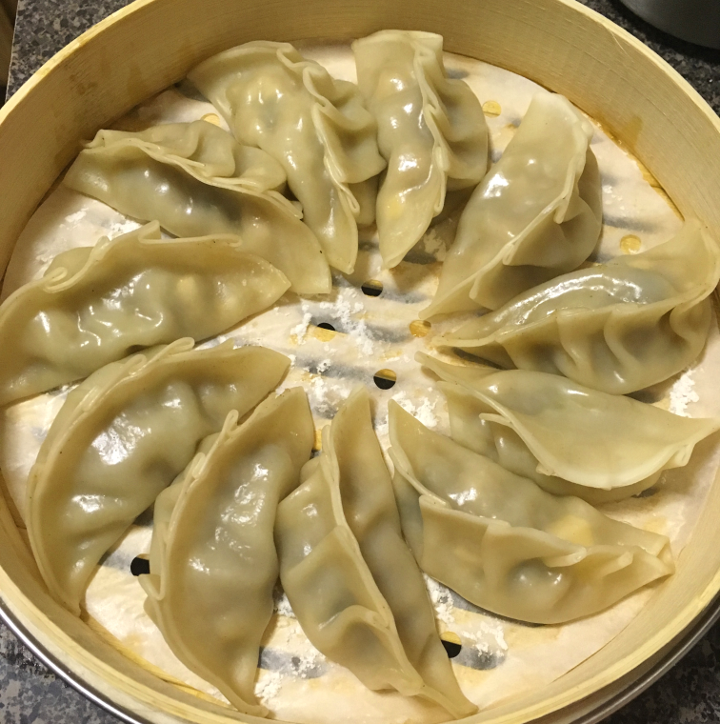 I spooned the filling into Northern-style dumpling wrappers and folded, then steamed for half an hour on low heat. I also used a bay leaf, green cardamom pods, cloves, and a cinnamon stick in the steaming water for aroma. 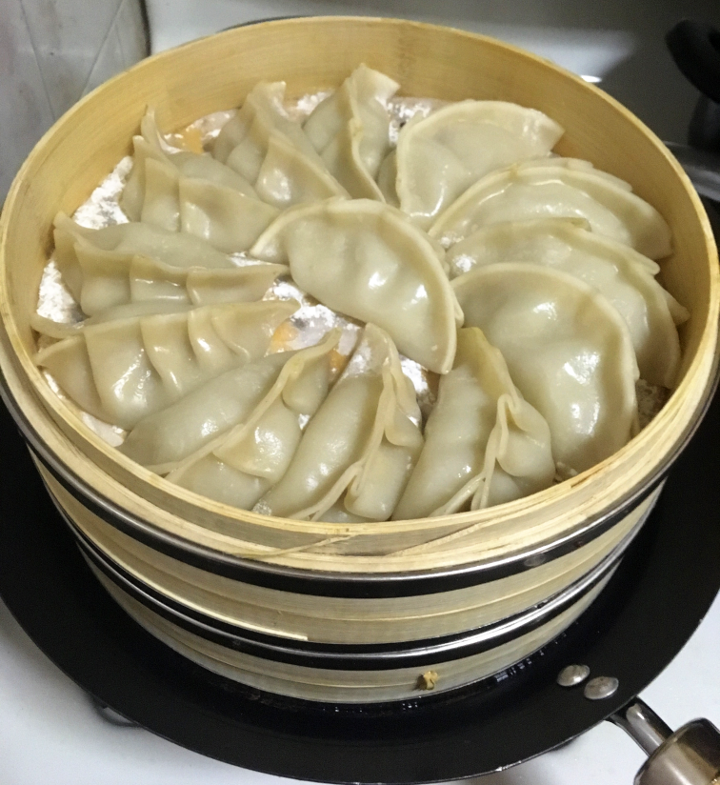 I have found that the dumplings should be removed from the parchment quickly after cooking to prevent sticking; using Northern-style (thick) wrappers and dusting the parchment with flour also helps. 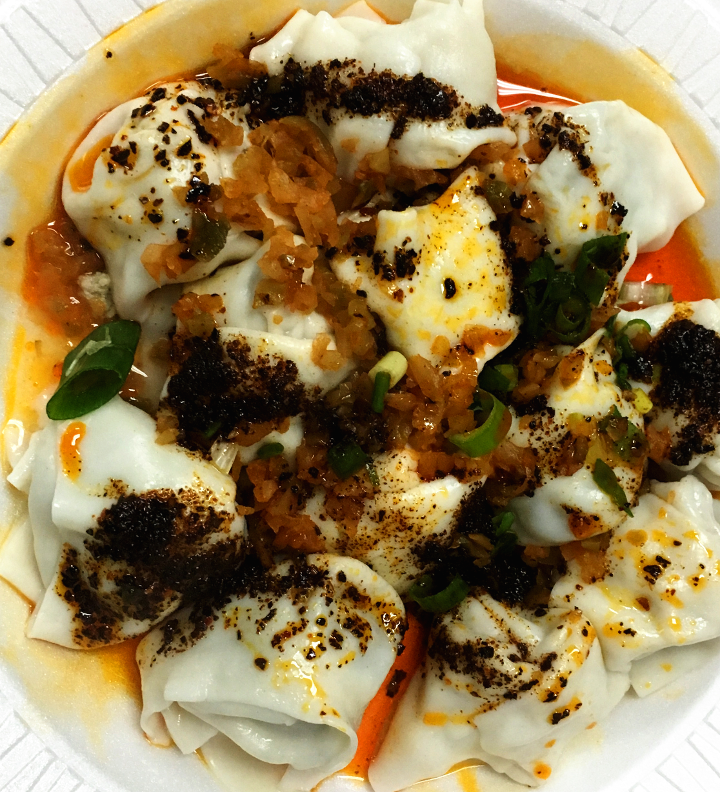 These momos are very different from Tibetan momos. 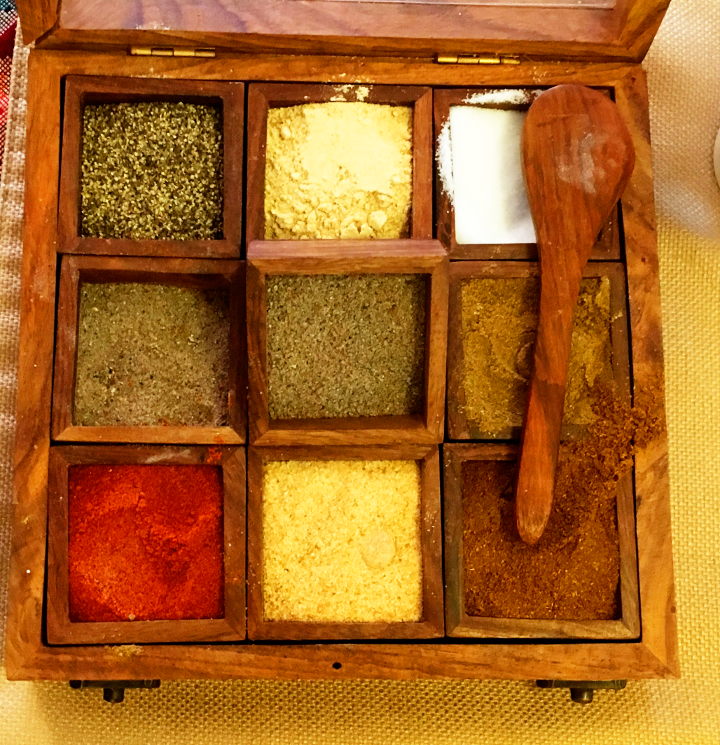 The flavor of the meat is wholly subordinated to the flavor of the spices (although it still makes an important contribution). 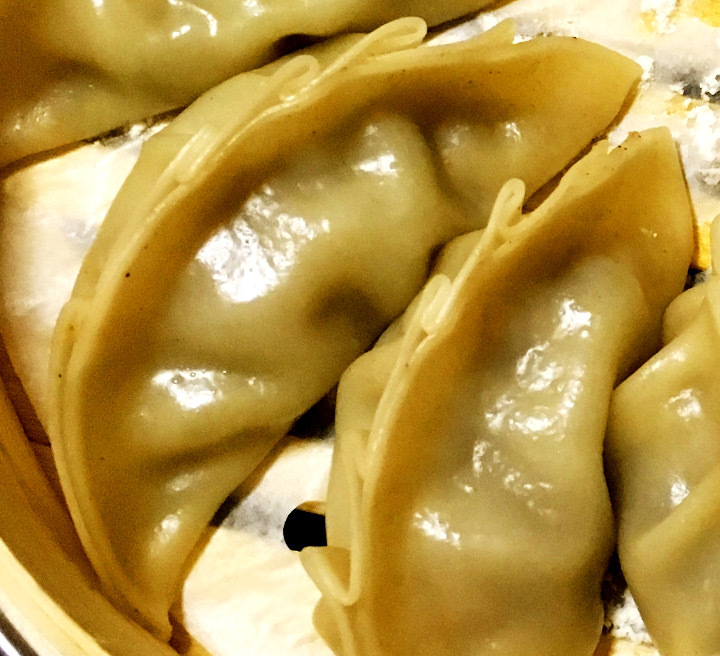 According to one journalist, this kind of momo has deep roots in the Newar community of Nepal, which had been trading with Tibetans for centuries and probably adopted and modified the Tibetan dish a long time ago. In any case, these Nepali momos are delicious. 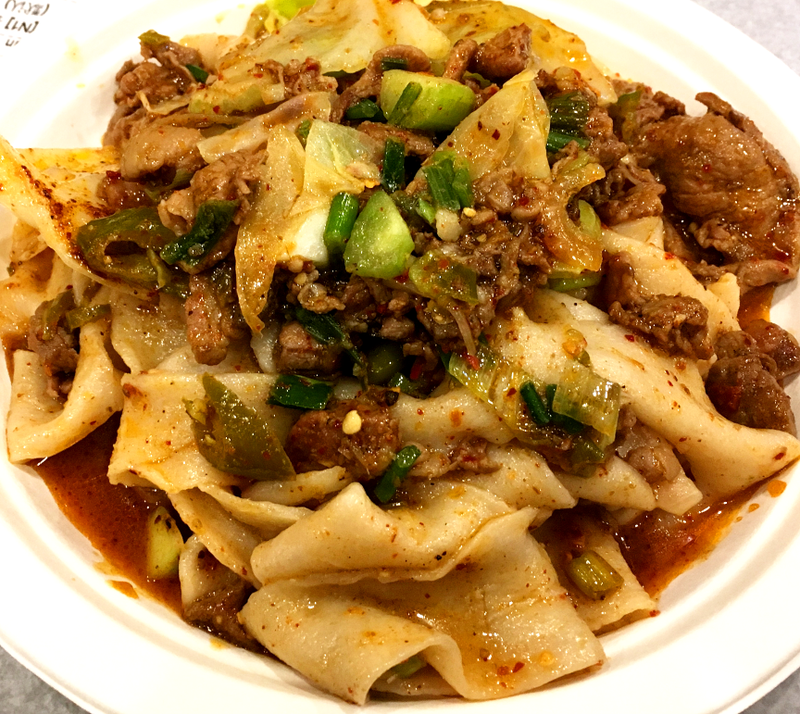 The menu at Xi’an Famous Foods features names like Chang’an spicy tofu and Mount Qi pork hand ripped noodles, recalling the dynasties, adventurers, and armies that Xi’an has seen in its long history. It was from Chang’an (as Xi’an was called in the Han dynasty) that Zhang Qian was sent out on the Silk Road by the emperor to negotiate with Central Asian tribes in the second century BC, and to which he returned thirteen years later with tales of a ten-year imprisonment and several other adventures among strange peoples in distant lands. Chang’an was also the city where the New Year’s Lantern Festival was supposed to have reached unparalleled heights of splendor and hedonism in the Tang dynasty. Mount Qi refers to a mountainous area near Xi’an, but may also call to mind the attempt of Shu Han (the kingdom of the South) to take Chang’an that lead to the disastrous Battle of Mount Qi. But we are in Flushing. Hip hop from the 1990s plays in the background and young couples on dates come in for a spicy meal. The hip hop is not merely a passing whim of the waitstaff: old-school hip hop always plays at Xi’an Famous Foods. 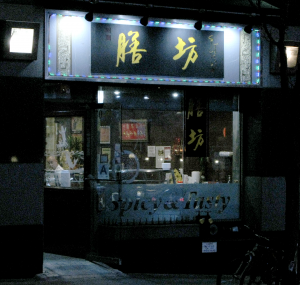 A plaque on the wall explains that the restaurant’s owner sees a link between the spicy, multicultural food of Xi’an and the spirit of old school hip hop. I am interested in the foods, of course. I order spicy cumin lamb hand-ripped noodles. Hand-ripped noodles, or biang biang mian*, originated in Shaanxi province (of which Xi’an is the capital). 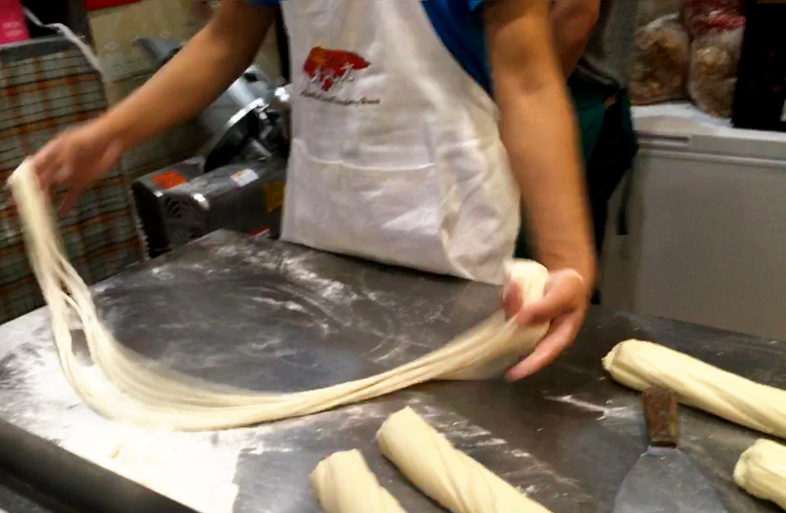 They are a kind of hand-pulled noodle. 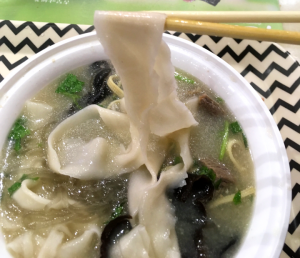 Unlike la mian, which are pulled until they are thin strands, biang biang mian are pulled into thick, broad straps of noodle, in shapes often compared to belts. And unlike the noodles of Zhengzhou, these are not braised—they are thrown in boiling water for several minutes and then served, making them a little less chewy. 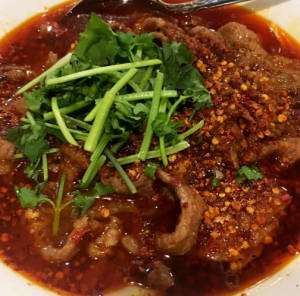 In Xi’an, they are often served with beef or lamb, probably partly due to the influence of the Muslim Hui population in Xi’an, who cannot eat pork. My biang biang mian come in a pile with sliced lamb, cabbage, and diced cucumber. This is all slathered thickly in cumin and chili oil, with a handful of sliced green chilies adding some extra fire. The noodles and lamb are hearty, the noodles chewy and the meat tender. A hint of Sichuan peppercorns gives the chili oil a tingling touch and a clean, high note. The cool cucumbers counterbalance the green chilies and round out the flavor. It is a very satisfying dish. The music track seems to be the only bold stroke in the ambience at Xi’an Famous Foods. But the interior design reflects the same interest in translation, making the food of Xi’an accessible for Americans. There are no decorative knots, Chinese landscape paintings, or imitation bronzes. There are no decorations at all; instead, the walls are covered in a mosaic of multilevel wood paneling. It is at once fashionable and generic in a way that is perfectly suited to chain restaurants. 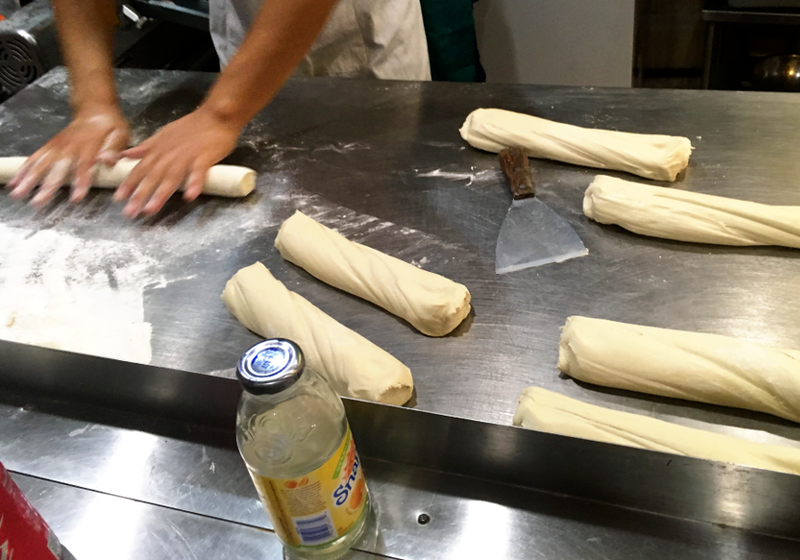 Indeed, from the original stall in the basement of Golden Shopping Mall (with a menu of four items), Xi’an Famous Foods has branched out to locations throughout Queens and Manhattan. It would not be surprising if they open locations in other major cities. The food is well worth trying, wherever you can find it. Their faces flare in the darkness; lightbulbs hanging from an awning illuminate the DVDs spread out on a table in front of them, and a TV fixed to the wall under the awning flickers as a movie plays. The three men are absorbed in a movie and don’t notice the pedestrians walking by. A little further on, an old man plays an erhu, and, at a diplomatic distance, another plays a violin—scraping out simple Western tunes like “Silent Night” and “Twinkle, Twinkle Little Star”. It occurs to me to wonder if to a trained ear the tunes played on the erhu are comparable to “Twinkle, Twinkle Little Star”. 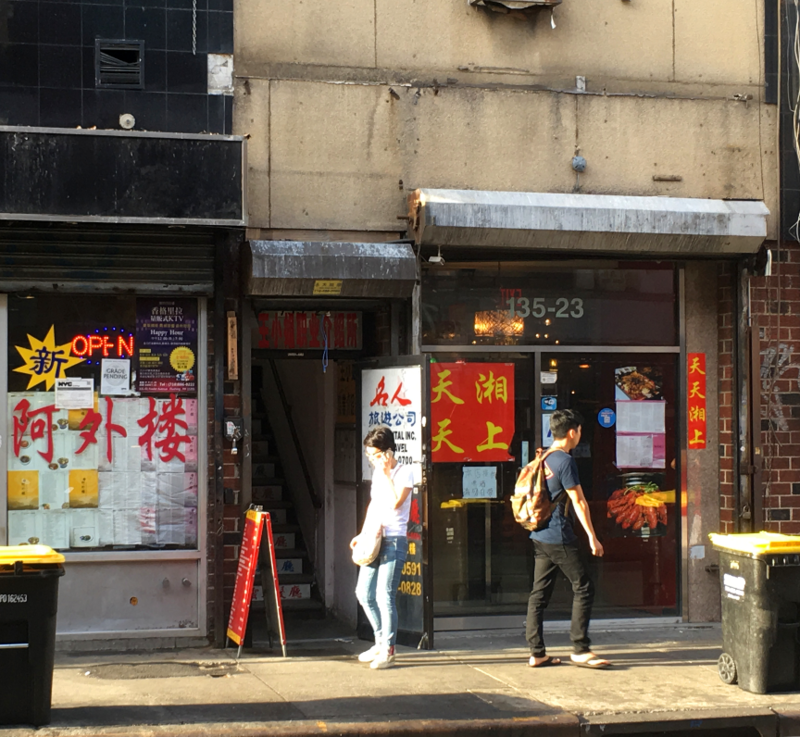 It’s Friday night, and the retail shops on Flushing’s Main Street are closing up, but the bakeries, bubble tea shops, and dumpling houses are crowded. 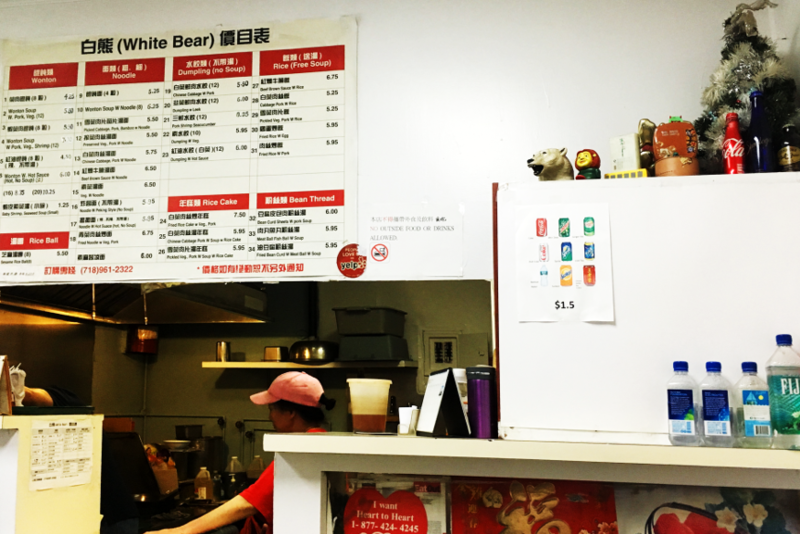 I am here to eat at White Bear, a modest establishment that has become a landmark among diners. The menu at White Bear contains several dozen items, but supposedly they really only serve one thing, number six on the menu. Indeed, when I was there, someone asked for longbao (steamed dumplings), and was informed there weren’t any (“mei you, mei you”). I didn’t get a chance to ask about dumplings. “Number six” is wontons with hot sauce, White Bear’s famous specialty. 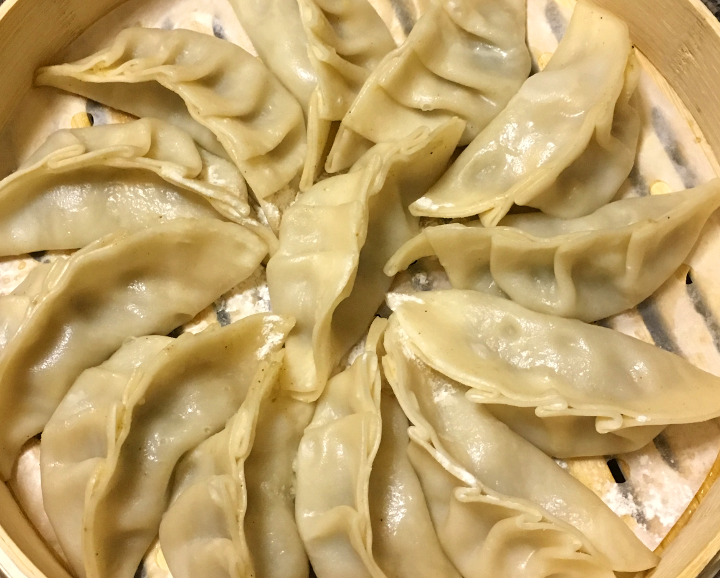 The distinction between wontons and dumplings may be a source of confusion, and I’ve found passionate debate online on whether there is any overlap between jiaozi (the little crescent dumplings traditionally eaten in northern China) and wontons. 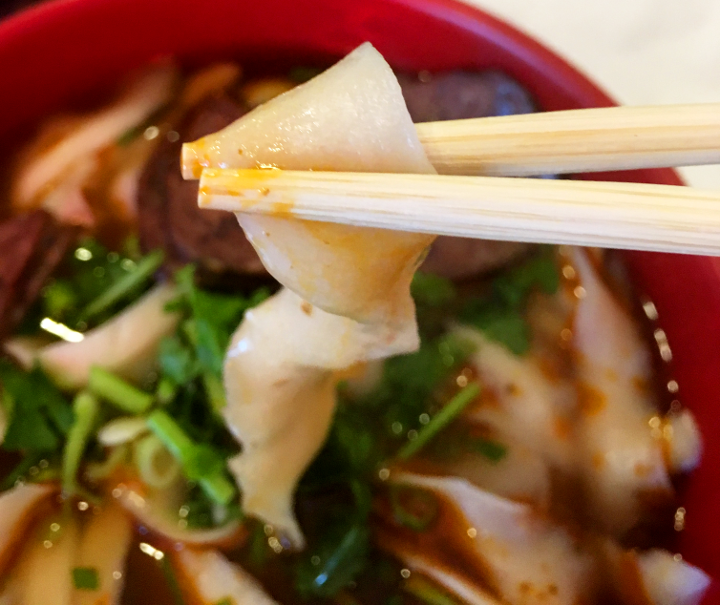 The word wonton derives from the Cantonese yuntun, meaning “cloud-swallowing.” Wontons generally have thin, pearly white wrappers haphazardly folded closed. When they are served in a soup, this can give them a cloud like appearance. (By contrast, jiaozi have thicker, cream-colored wrappers that are neatly pleated along a crescent moon shape.) In any case, wontons are all you are likely to find at White Bear. White Bear has no more space than one of the cramped dumpling shops that line the dingy shopping malls and food courts along Main Street—it is distinguished only by having an outside awning. There are four tiny tables crammed close together, and there is little to look at, save for the menu and some bric-a-brac on top of a refrigerator. I sat and watched a pair of mosquitos that had come through the open door as I waited for my food. I didn’t wait long. The wontons (brought to me with a sharp “eh!” as if I might have fallen asleep) were beautiful. Glowing white, sprinkled in blackened chili and pickled vegetables, splashed with chili oil, they were a pleasure to look at. And they were delicious. The pork filling was soft and succulent, and the chili gave it a deep smoky taste. The pickled vegetables sweetened and rounded out the dish. The menu at White Bear, like the playing of a certain violinist, might be more aspirational than accomplished–but the wontons are certainly worth a visit. 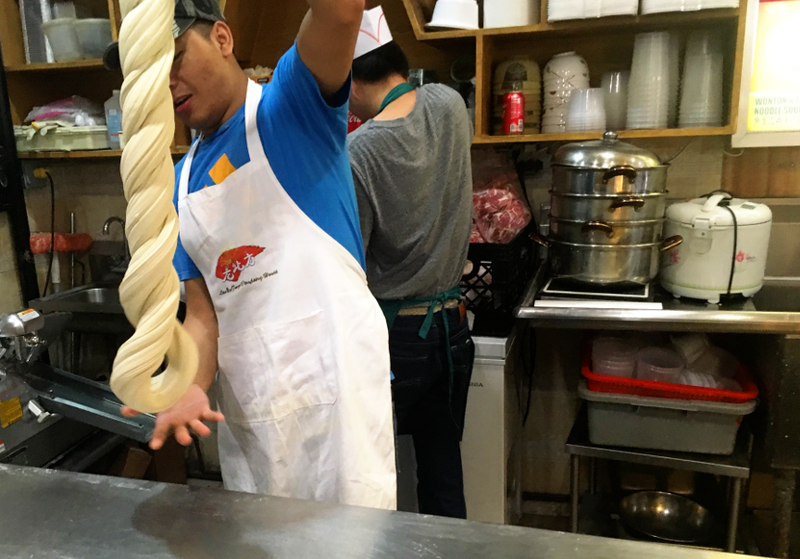 “In Zhengzhou, they keep the noodles hot in big pots of water all day…hand-pulled noodles. 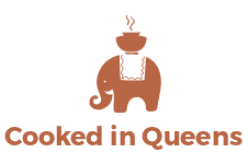 They are cooked just before serving.” I was sitting at a cafeteria table in the food court at New World Mall, and had consulted my neighbor about the characters in the restaurant’s name. “Zhengzhou is a city,” he had said uncertainly…“and these are a kind of noodle.” Then he had consulted his wife, sitting next to him, who happened to be from Zhengzhou. Zhengzhou lies between Xi’an and and Jinan on the Yellow River. China’s mythical founding father, the Yellow Emperor, is said to have established his rule here some five millennia ago. The Xia and Shang dynasties are also said to have ruled here (in the third and second millennia BC). The city rivals Baghdad, Memphis, and Athens for ancient culture. 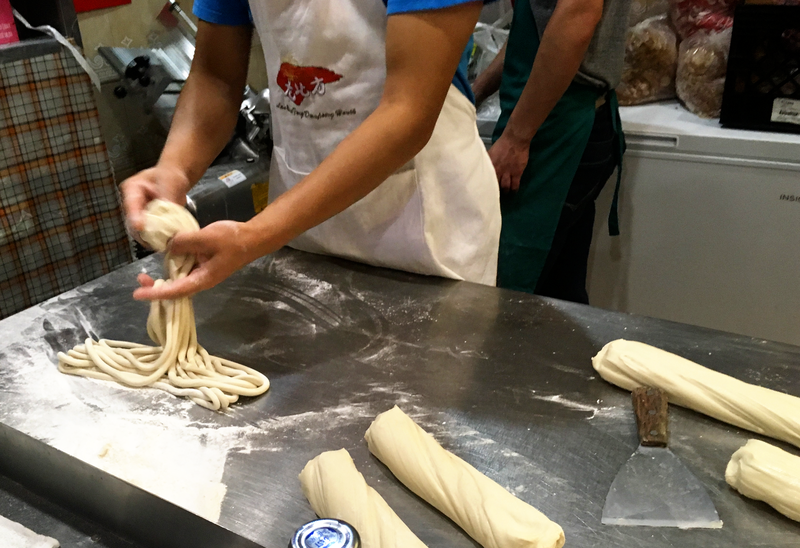 It may not be surprising that the cuisines of Xi’an and Zhengzhou share some things in common, such as a fondness for hand-pulled noodles. Of course, both Xi’an and Zhengzhou are northern cities, and so the diets there have historically included a lot of millet and wheat, and not much rice. But there was likely a great deal of cultural continuity between the cities too. 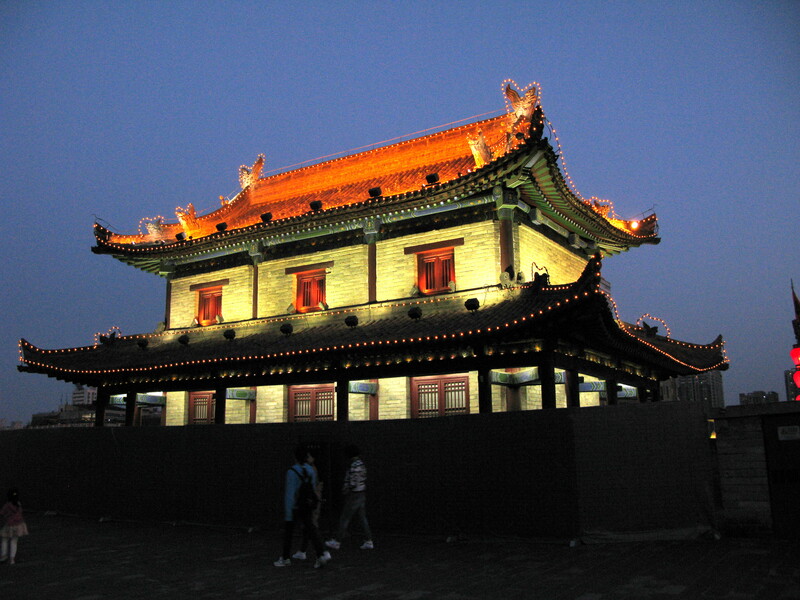 The capital moved from Zhengzhou to Xi’an and then back to a city neighboring Zhengzhou during the Zhou dynasty. Today, it is a short train ride from Zhengzhou to Xi’an. In any case, the process my neighbor’s wife was describing is a kind of braising. In Zhengzhou, they partially cook the noodles at low temperature and then, just before serving, cook them quickly at high temperature. The result has a chewy texture very like that of pasta. In the dish I had ordered, hand-pulled noodle with lamb soup, the hand-pulled noodles—thick and long ribbons—mingled with glass noodles, wood ear fungus, sliced dry tofu, cabbage, and bits of roast lamb. It was delightful. On a separate trip to Zhengzhou Hand-pulled Noodles, I ordered “old duck soup.” This was mainly a mixture of glass noodles, sliced dry tofu, cabbage, tofu, and duck offal. One of the main items in this dish is duck blood cakes, which are dark-red patties of cooked duck’s blood. I mistook these for liver at first, but the flavor is milder and smoother. The other offal included heart, liver, and stomach. There was also a nice clump of gold needle mushrooms. The old duck soup had the superior flavor, with the subtle warmth of spices and rich seasonings that seemed to include ginger. 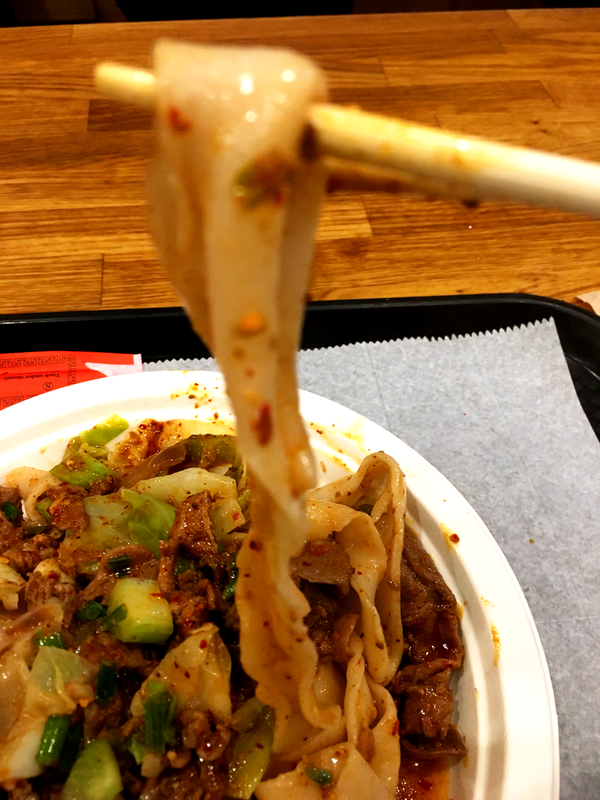 The braised hand-pulled noodles are, however, excellent, and their texture alone makes them worth trying. For adventurous eaters, the menu also features duck blood soup (which I assume contains raw blood). For dessert, I walked over to E Noodle Village, which has a few sweets. I ordered sweet black sesame dumplings. This consisted of a mildly sweet liquid in which floated lychees, sesame dumplings the same size and shape as the lychees, and sesame seeds. This is a restrained, perhaps even Spartan treat. Next time I think I will try tapioca balls at the Taiwanese stall nearby. It is nearly nine, and the entire staff gather around a large table at the back of the room to eat. They laugh and chatter as they eat—a cheerful, familial team. I am, for a time, the only customer, and I require no attention, being fully absorbed in my food. Spicy & Tasty is a well-known Sichuanese restaurant, and I have ordered two distinctly Sichuanese dishes. The first dish is Chengdu-style Cold Jelly. 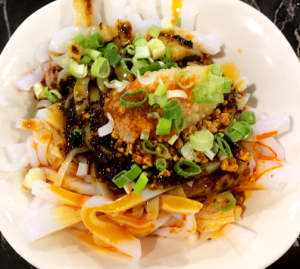 This consists of a kind of translucent, jelly-like sliced noodles, drenched in spicy sauce. 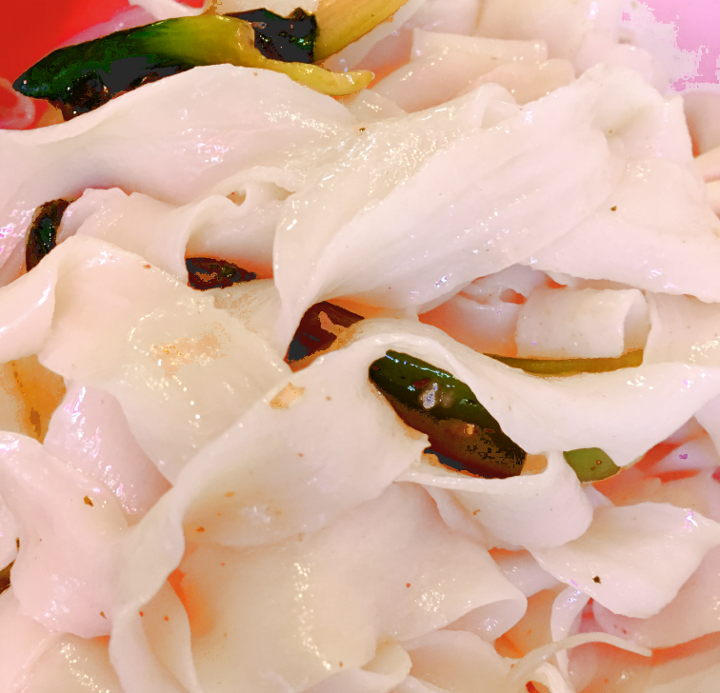 Like glass noodles, these are made from bean or potato starch; but these are thick, cut from sheets. The sauce seems to contain some kind of fermented bean paste, as well as chili peppers and spring onions. It is complex and delicious. The second dish is sliced lamb in fresh hot pepper. The sliced lamb floats in a bowl of red sauce, along with sliced Chinese cabbage. 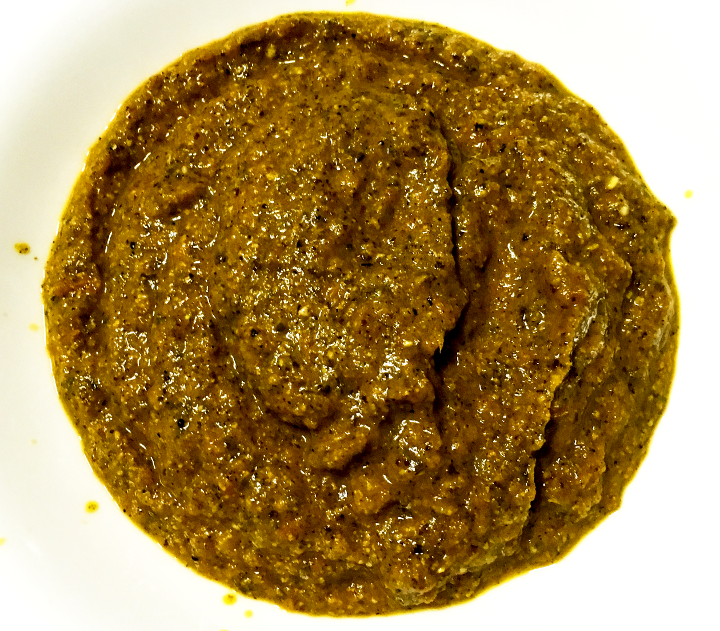 The hot chilies in this sauce are powerful, and at first dominate the flavor of the dish. But the sauce also has a fresh, almost minty flavor that numbs the tongue slightly. This is Sichuan peppercorn. Sichuan peppercorn is one of the oldest seasonings used in Sichuan, far predating the arrival of chili peppers in China, and remains one of the most distinctive features of authentic Sichuan cooking. I believe it is usually paired with chilies in contemporary Sichuanese food, constituting one of the pair of attributes usually associated with Sichuanese food—ma and la, or numbing and hot. The sliced lamb is addicting. The combination of ma and la tickles and delights the tongue, and the perfectly cooked meat is completely satisfying. Though the bowl is large, I feel as though I could eat another. Spicy & Tasty has a long menu, and the restaurant doubtless warrants repeat visits. I have my eye on in particular on smoked tea duck (another Sichuanese dish) and frog in fresh hot pepper. There are some interesting replicas of ancient Chinese artworks (such as a jade axe) in glass cases in the walls, but this does little to temper the businesslike feel of the dining area. The tables have faux marble tops and the room is coldly lit by overhead lights. 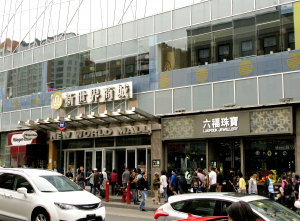 Despite the excellent food, this may be a problem for Spicy & Tasty, as a beautiful outdoor mall has opened across the street, hosting two Sichuanese restaurants that both feature thoughtful and alluring interior design, and that have both serve food that has received highly positive reviews.